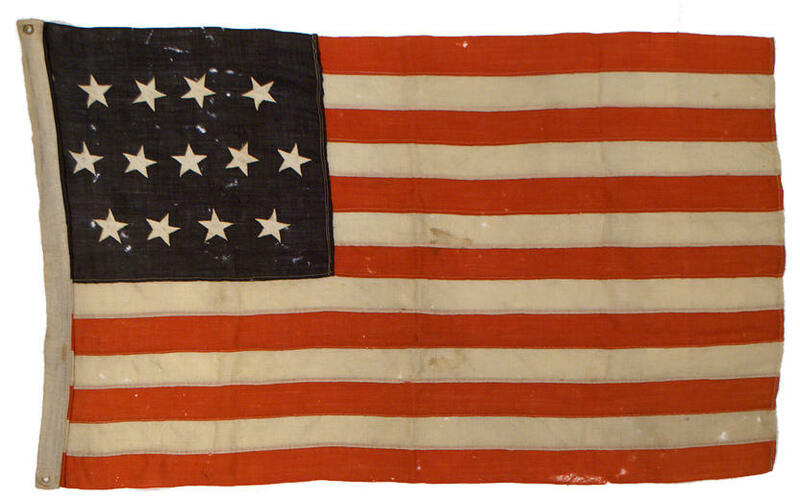 Although the 4-5-4 pattern of 13 star flags is one of the earliest documented configurations of 13 stars used on an American flag, its use in the years following the Civil War was extremely limited and rare. 13 star flags were widely used into the 20th century, most commonly for maritime and naval vessels. The predominant pattern found on those of the late 19th century is the Francis Hopkinson pattern of 3-2-3-2-3. The pattern of this flag, along with subtle characteristics such as the freely rotating stars, are stylistically reminiscent of earlier American flags. The stars of the flag are machine stitched with a lineal stitch, rather than a zig-zag stitch. The zig-zag stitch became predominant from the mid 1890's into the 20th century, therefore an estimation of the date of this flag as circa 1890 or perhaps earlier is reasonable. The flag's deep blue canton, pleasing proportions, small size, and rare star pattern combine to make this wonderful flag visually striking, very scarce and desirable. Learn more about how Americans care for and repair their flags.